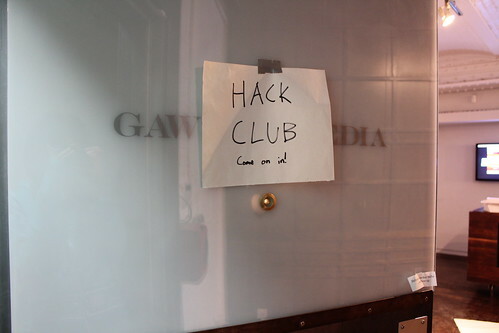 Sorry you couldn't make it to this Hack Club? It's OK, we understand, but you'd better bookmark HackClub.org (AKA breadpig.com/hack-club) so you don't miss out on the next one! At around 9 PM last Friday, people started trickling into 210 Elizabeth St. in SoHo. Inside, an unusual scene: the so-new-they-haven't-moved-in-yet offices of Gawker Media was filled geeks from around New York, who were gathered around an enormous table covered with LEGOs. For the next 12 hours, they drank coffee and ate caffeinated marshmallows, schemed and built, laughed and napped, and, most importantly, built awesome sumo wrestling LEGO robots. At 7 AM, the 38 participants, organized into 14 teams, started pitting their robots against each other in a double elimination tournament. I was personally very impressed that every team had a functional robot, and by the variety of strategies teams came up with. 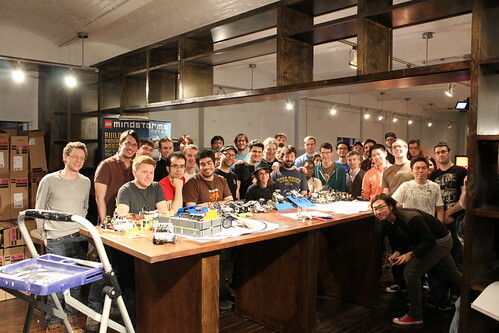 The team that ended up taking the day (and 3 Mindstorm NXT 2.0 kits!) 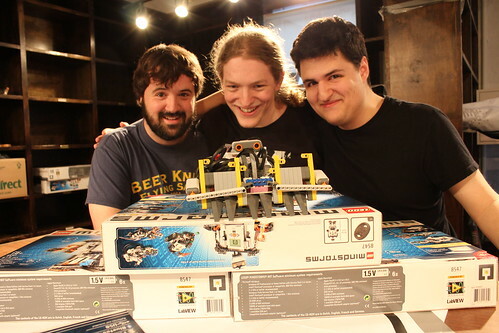 was Matt, Sidney, and Sam of New and Improved Partially Robotic Bulldog of Death, Destruction, and Gracious Professionalism. NAIPRBODDAGP was so intense about testing they built their own ring as well as their own dashingly handsome opponent to test against, and their hard work paid off--they went through the tournament losing only one match to runners-up Trammell and Jeff of Impedance during the finals. I recommend checking out this video taken by Trammell Hudson of the most epic match of the tournament! 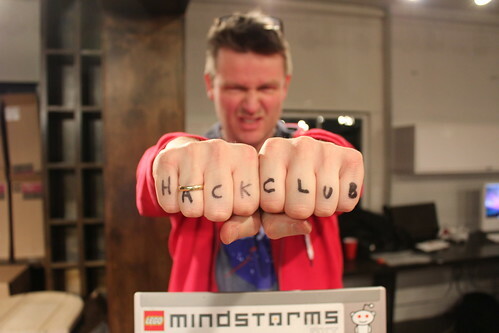 For more pictures of Hack Club, go here or just look up the tag "hackclub" on Flickr. Erik is working on some kind of sweet video from all the footage he took during the whole thing, so we'll definitely post about that when it's done! Now that the event is over, the mountains of LEGOs will be taking a permanent vacation to Jamaica to hang out with our friend Marvin Hall, TED fellow and practiced marsh jumper. Marvin is an innovative educator who runs a series of afterschool programs and summer camps called Lego Yuh Mind that use LEGOs to teach kids 3-13+ about engineering, storytelling, and art. To grant kids in impoverished neighborhoods access to these types of learning opportunities, Lego Yuh Mind gives out scholarships and hosts workshops in many of garrisons of Kingston. Lego Yuh Mind also organizes FIRST LEGO League robotics teams from Jamaica who then compete in the United States--I had a chance to catch up with them when they were at a tournament in Massachusetts, and the amount of fearless enthusiasm and curiosity among these kids was contagious. 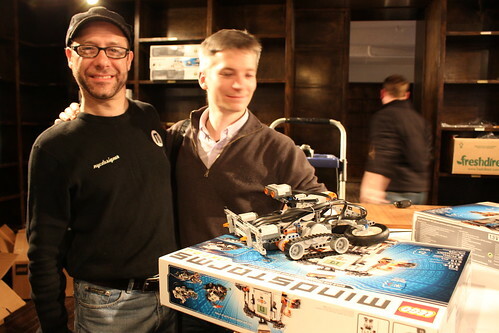 Once again, we'd like to thank LEGO for donating >120 pounds of LEGOs, Gawker Media (esp. Scott Kidder and Jeremy Chase) for being so generous with their space, Pete Hottelet of Omni Consumer Corporation for the Stay Puft Marshmallows, Matt Watkins for the brilliant puzzle, Erik Martin and Jason Curtis for videography and general assistance, Brennan Moore for being an amazing sumo rink creator, and, of course, EVERYONE WHO CAME OUT so that Alexis and I didn't have to be forever alone. Ideas, suggestions, etc. for the next one? 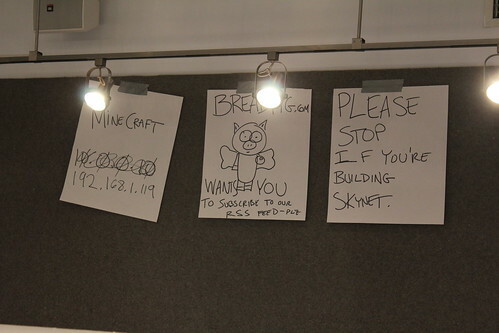 Email Christina@breadpig!